B-STYLE COLOR CONDITIONER 750ML – HAIRDEPOT - Hair & Scalp Care Products, Prevent Hair Loss, Shampoo, Conditioner, Treatment, Styling, Appliances and more! Since 1970, Farcom continues on its successful path offering high quality sampoos & conditioners to professionlal hair salons, both in Greece and abroad. 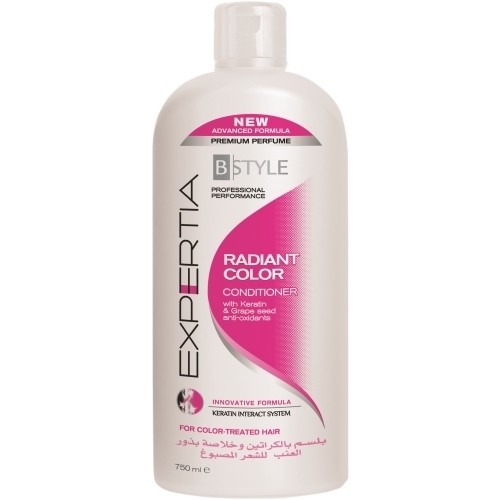 The same salon quality, trusted and recomeded by professional hairdressers for more than forty years, is now available in the Bstyle Expertia line. Ideal for Color Treated hair. The formula of the Radiant Color conditioner is based on the beneficial properties of the Keratin amino acids, which help keep and restore hair&apos;s natural balance and healthy look. The natural anti-oxidants grape seed in conjunction with the reinforced conditioning agents contained, protect your hair from the daily environmental damage, such as environmental pollution, sun rays, salt water, frequest washing, blow drying, helping to preserve its color and vitality. Detangles and makes hair easy to comb without overburdening it.